Turrall Fly Pod Stillwater Nymph Selection, natural nymphs, which are the immature stage of aquatic insects, have a long life in the water and are a major, if not the foremost, insect food source for stillwater trout. This selection contains all the most popular nymphs including Hare's Ears, Damsels, Pheasant Tail's and Montana's. 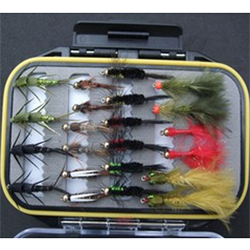 Turrall Fly Pod Stillwater Nymph Selection contains 22 flies in 11 patterns.